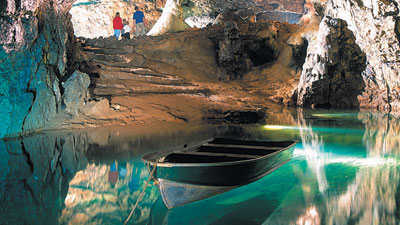 Wookey Hole Caves is a major destination for locals and tourists alike in Somerset. Conveniently located in the village of Wookey Hole which is on the border of the Mendip hills near Wells, the Caves are fantastic to witness and offer some truly beautiful sights without the need for safety equipment. The walk through the Caves gives an impression that you are passing though an ancient world filled with rock and stone, with shimmering water and ambient light. Visitors are often fascinated by the Witch of Wookey, a hunched outcrop of rock which slightly resembles a human figure and is said to be the petrified remains of a sorceress turned into stone by a Glastonbury monk. 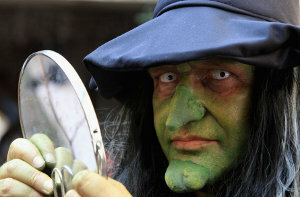 Although the resemblance to any person, fictional or otherwise, is hard to see at times, the Witch lends a suitably spooky air to any visit and is – quite understandably – the subject of endless local myths. The heritage of the Caves is impressive, too: their part in social history has been assured for thousands of years by their consistently low temperature of 11 degrees Celsius (52 degrees Fahrenheit), which enables Cheddar cheese – the region’s most famous export – to be manufactured there. Even in Roman times, lead mining was carried out in the Caves. The immediate surrounding area contains the river Axe which passes from the Caves to other caverns such as Swildon’s Hole and St Cuthbert’s Swallet. The oldest functioning paper mill (at over four centuries old) is also in the location. Further down the river and Ebbor Gorge, has a site of special scientific interest due to the unusual nature of its rock formations. The Caves themselves are the central attraction of the Wookey Hole complex, though there are many other attractions nearby. The caves are owned by circus entrepreneur Gerry Cottle; the Cottle organisation has extended and equipped the site to add a valley full of large dinosaur models, a magic garden with elves, dragons and other fairy creatures and a children’s play zone themed along pirate-ship lines. Wells, the smallest settlement with official city status in England, is close by, making a visit to the area worth spreading over a whole day.